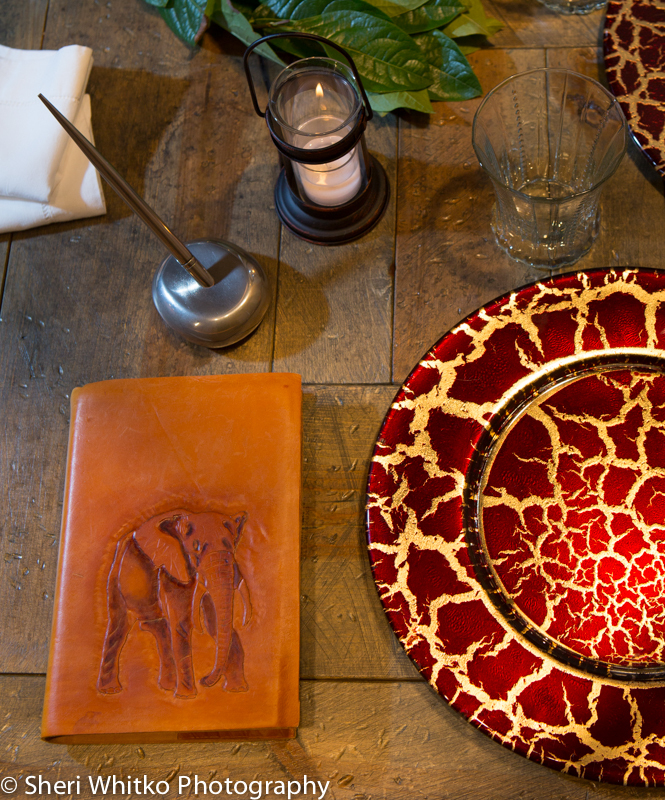 It may have been the Red Crackle charger that sparked Ted Grady, co-owner of J&L Catering, in the first creative moments of design, but his mind exploded with ideas when he started down the path of "Lunch on the Serengeti". 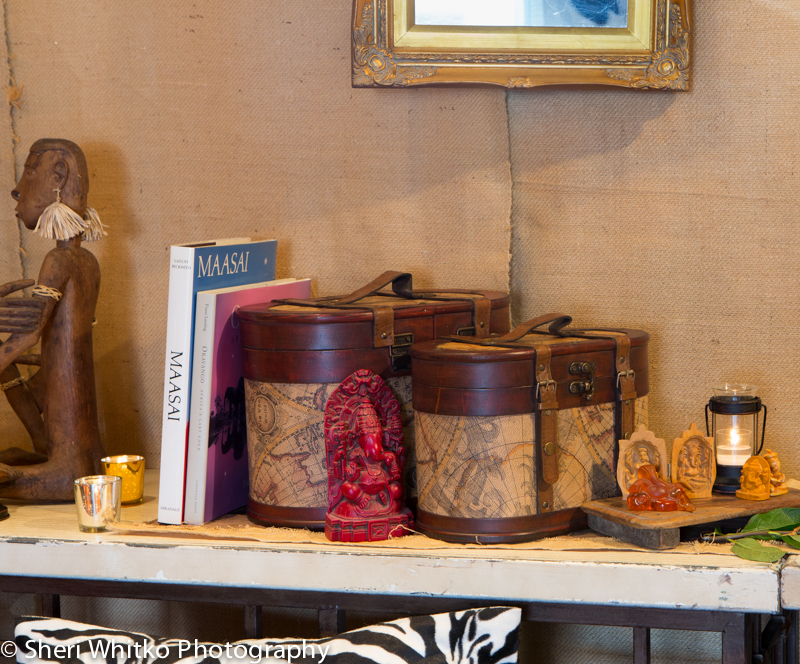 The props he uses as accent pieces blend seamlessly with quite an assortment from our inventory. Where most people would place flatware, Ted uses a buttery leather bound journal and a silver pen holder scrounged from Martha's office that probably hadn't been polished since Kathy gave it to her as a gift when they became partners! 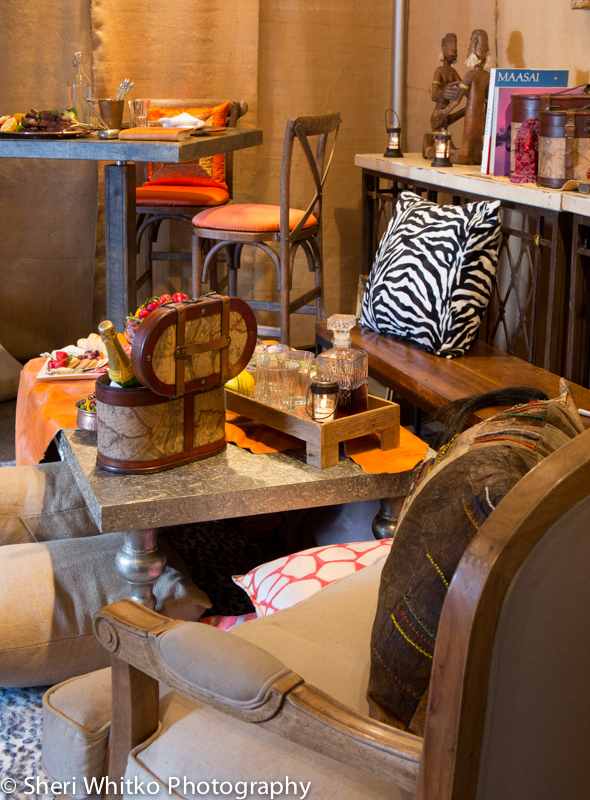 J & L is known for eclectic mixes in their buffet designs. Our Black and White Spotted Rug starts the theme, but it is the mix that makes the look so authentic. 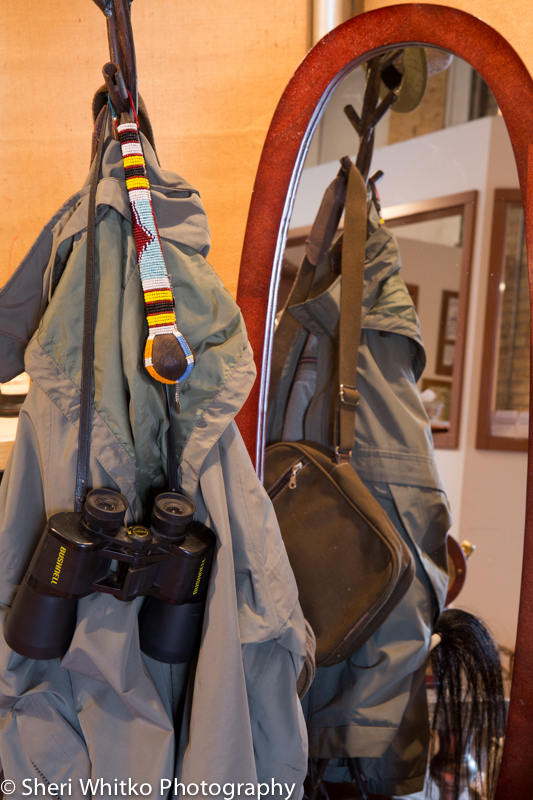 Ted went on safari in Africa earlier this year and many props he uses heighten the authenticity-including his hiking boots, and binoculars together with pillows and a rope chandelier from Kehoe Designs. Nitin Vyas, an event industry veteran who recently joined J & L as an Event Planner, contributed many bibelots, too. Our Aged Bronze Console Table is laden with an Indian Patlie, a little wooden stool from Nit's own childhood, wooden and topaz sculptures of Indian gods next to an African wooden sculpture contributed by Ted. Sharing props, sharing ideas...this tableau illustrates how these two men think alike and work collaboratively. 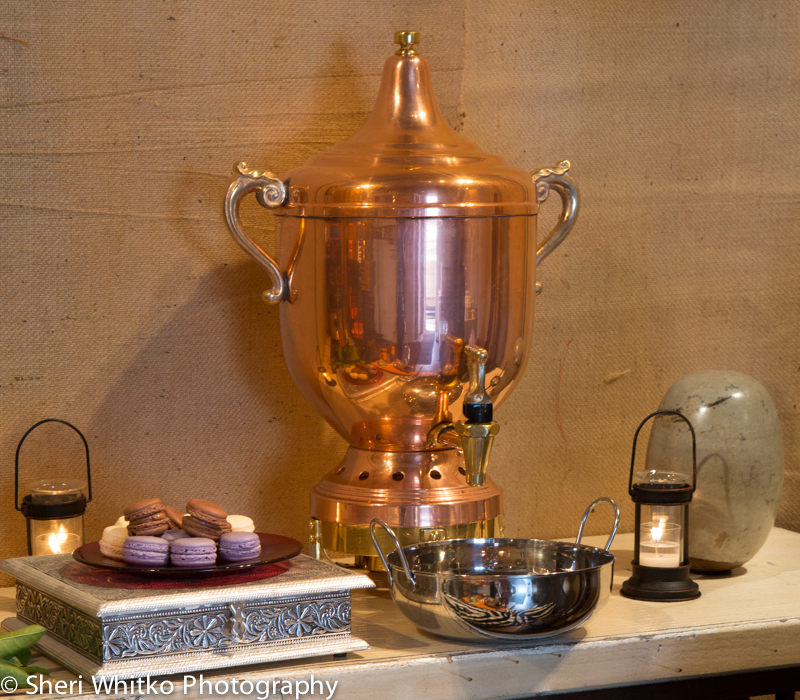 Even our copper urn is used in an unexpected way. Ted explained that safari tents are always supplied with wash basins, represented here by an Indian Kadai Bowl. We love how Ted and Nit had the vision to pull together our new Crossback Weathered Bar Stool, Vintage Country French Chair, Aged Farm Wood Highboy, Embossed Silver Coffee Table, filigreed Aged Bronze Console Table and a French Industrial-styled Recycled Wood Bench and make it look authentically African. Nit insists an important part of the creative process is teamwork. 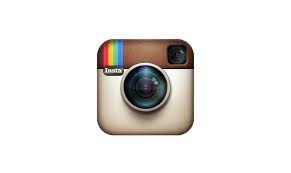 His philosophy is "One person get's a starting point of an idea and another person can build on that. It takes a team, as only a team can succeed." Their buffet table is a wonderful blend of colors and materials including something that has been a long-standing part of their own inventory at J & L: wood. 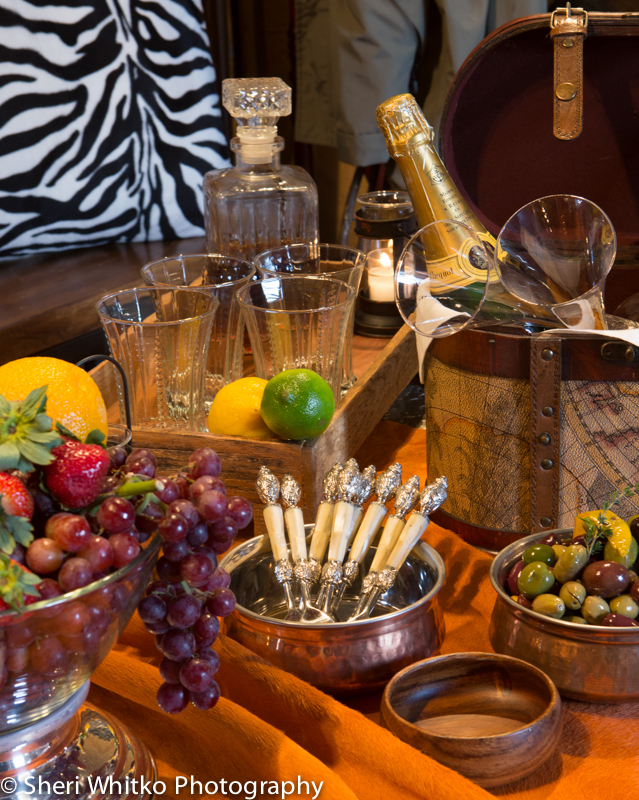 Featured here are our Ecowood small bowl and our new Wooden Footed Tray which holds Vintage Beaded Glasses and our Cut Glass Decanter. 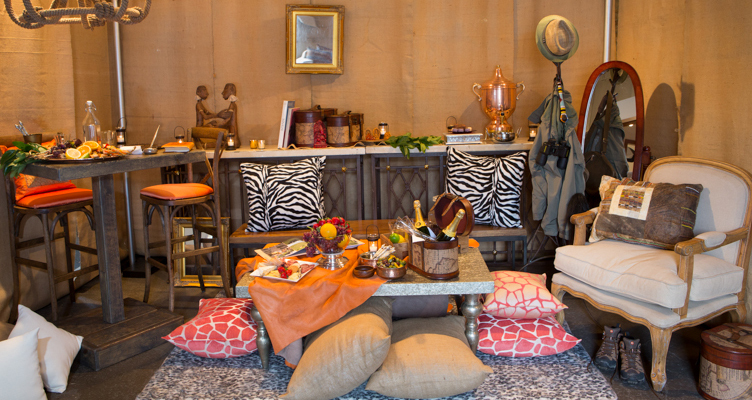 As much fun as Ted and Nit had making this vignette authentic with the eclectic mix of rental and personal props, Ted stood back and had to admit (and surely his co-owner Chef Kevin Kelly would agree), " the menu always dictates design." 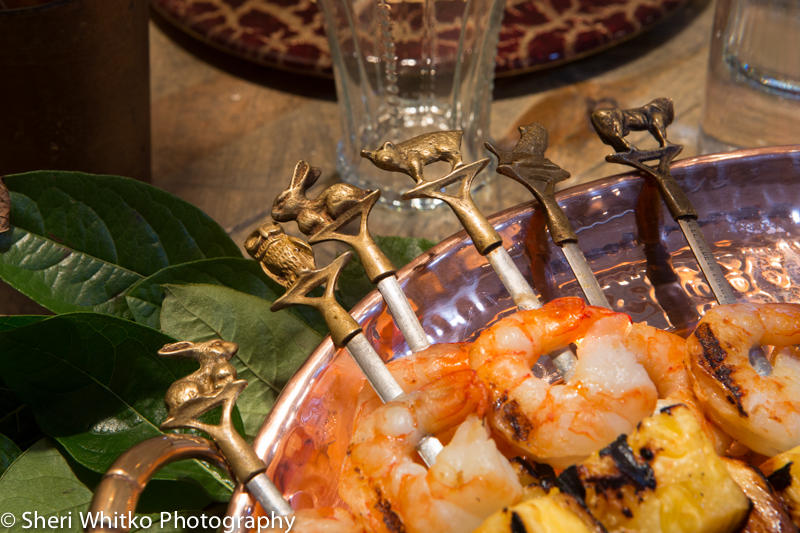 Once they settled on shish kabobs though, is it any surprise that Ted's animal capped skewers made the plate? The attention to every last detail again appears in the clever placement of the Full Length Tilting Mirror to show the props on both the front and the back of the coat rack. And finally, we couldn't resist closing with an amazing photo taken by Ted that was submitted to National Geographic for potential publication. One person who was especially impressed is Ted's good friend and this month's photographer, Sheri Whitko of Sheri Whitko Photography. 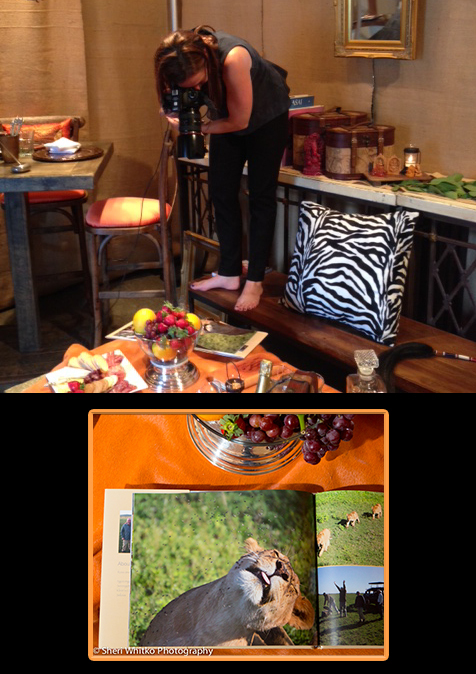 She went to extreme lengths to get every shot perfect, including standing in the middle of the vignette to capture Ted's photo of the lioness--just a little behind the scenes look at how our photographers get these wonderful shots for us.